Learn how to become and astronaut in this exciting title! 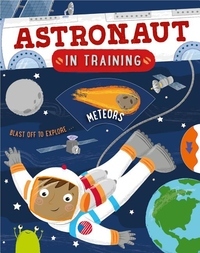 Packed with bitesize information and fun facts about the life of an astronaut, Astronaut in Training will tell you all about space, astronomy, and life on the International Space Station. And for added entertainment, a novelty wheel in the front cover turns to reveal the book's topics, with a surprise extra activity inside the cover. Simple activities will test your skills and reinforce the information you read in the book. Can you help to repair the ISS on a spacewalk? Or remotely control a Mars rover? Or even spot constellations in the sky? Take a look inside to find out!